GOLD AND BLACK ILLUSTRATED VOLUME 28, ISSUE 6 35 great. Some of the really good players, once they get locked in and they turn it on, it's tough to back them down and get them to relax. You almost see a fighter, a boxer, (and) a coach rubbing his shoulders like, 'Chill out. I know you're getting ready to do battle but stay loose, stay loose.' Sometimes Kirk will get after it and get so locked in that if he pulls off, there's something that has to take the place of whatever he was focused on. For us in the fall, that's Saturdays. He can let it out. "That motor, that's good for the young guys to see that he's not taking it easy. He's not complacent. He's still coming (at you), which is awesome." Barron's insistence on the weight room means plenty of recovery, too, and as he's gotten older, he's learned to better take care of his body. But that doesn't mean if he's injured, he'll take a break. No breaks. Even when maybe he should. 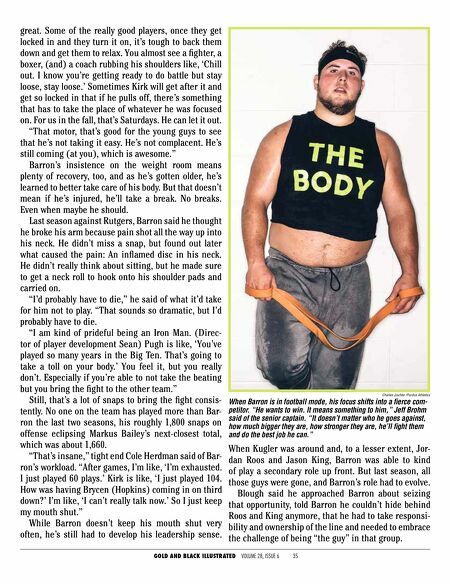 Last season against Rutgers, Barron said he thought he broke his arm because pain shot all the way up into his neck. He didn't miss a snap, but found out later what caused the pain: An inflamed disc in his neck. He didn't really think about sitting, but he made sure to get a neck roll to hook onto his shoulder pads and carried on. "I'd probably have to die," he said of what it'd take for him not to play. "That sounds so dramatic, but I'd probably have to die. "I am kind of prideful being an Iron Man. (Direc- tor of player development Sean) Pugh is like, 'You've played so many years in the Big Ten. That's going to take a toll on your body.' You feel it, but you really don't. Especially if you're able to not take the beating but you bring the fight to the other team." Still, that's a lot of snaps to bring the fight consis- tently. No one on the team has played more than Bar- ron the last two seasons, his roughly 1,800 snaps on offense eclipsing Markus Bailey's next-closest total, which was about 1,660. "That's insane," tight end Cole Herdman said of Bar- ron's workload. "After games, I'm like, 'I'm exhausted. I just played 60 plays.' Kirk is like, 'I just played 104. How was having Brycen (Hopkins) coming in on third down?' I'm like, 'I can't really talk now.' So I just keep my mouth shut." While Barron doesn't keep his mouth shut very often, he's still had to develop his leadership sense. When Kugler was around and, to a lesser extent, Jor- dan Roos and Jason King, Barron was able to kind of play a secondary role up front. 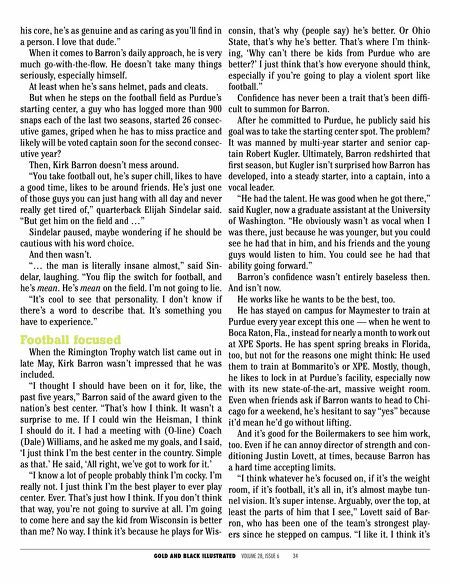 But last season, all those guys were gone, and Barron's role had to evolve. Blough said he approached Barron about seizing that opportunity, told Barron he couldn't hide behind Roos and King anymore, that he had to take responsi- bility and ownership of the line and needed to embrace the challenge of being "the guy" in that group. Charles Jischke /Purdue Athletics When Barron is in football mode, his focus shifts into a fierce com- petitor. "He wants to win. It means something to him," Jeff Brohm said of the senior captain. "It doesn't matter who he goes against, how much bigger they are, how stronger they are, he'll fight them and do the best job he can."